You don’t have to blow your budget to eat great meatless and dairy-free meals every day. With Vegan on the Cheap, you can enjoy delicious vegan meals every day of the week — and save money. 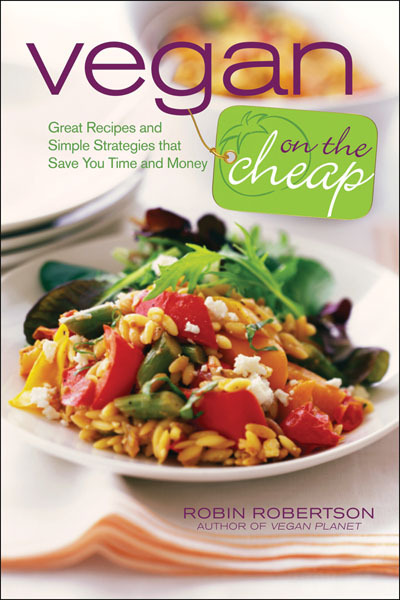 Vegan on the Cheap contains 150 mouth-watering, exciting recipes that cost just 50 cents to $2 per serving—hefty savings to go with hearty vegan meals. This book presents great options for savory soups and stews, satisfying salads, comforting noodle dishes, first-class casseroles, favorites for the slow cooker, and meatless and dairy-free recipes for classics like pizza, burgers, and sandwiches. Plus, there’s even a chapter for desserts to satisfy every sweet tooth. The book features handy cost-per-serving icons that highlight the cost of each affordable dish. It’s packed with affordable recipes and money-saving tips, this is the ultimate economical resource for every vegan kitchen. Paperback, 272 pages, John Wiley & Sons, Inc.